We could have sworn the days of exclusive private clubs were over during the recession, especially ones that are essentially a glorified time share. It seems we were wrong. 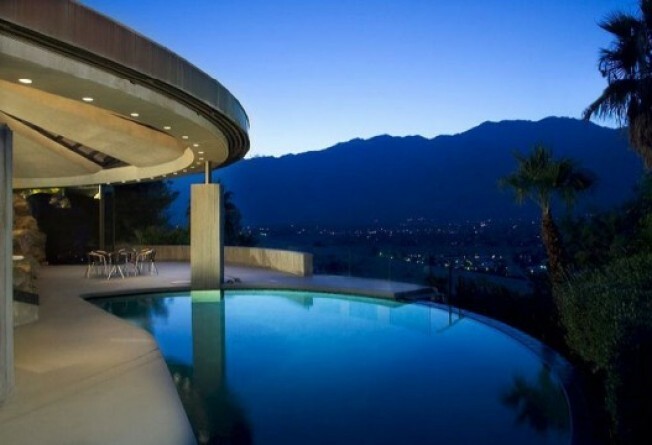 John Lautner's 1968 Elrod House in Palm Springs, which has been available for rent for years to anyone who could cough up the dough, is now for rent only to members of the Southridge Club, a new club that launched a few months ago. "It's a way of controlling who comes," says Southridge Club operator Wolf Worster of the club. "And a way of controlling the mass villa rental industry." It seems the Southridge Club is an "invitation-only" luxury villa club in Palm Springs. According to its web site, there's a maximum of 18 members. Hurry up and get 'em before they're gone! It only costs $100,000 per year based on three years. But included in that cost is "concierge services, daily housekeeping and a variety of other personal services." At that price, if you're staying at the Elrod house (notably featured in the James Bond movie "Diamonds Are Forever") then it should come with Bond girls Bambi and Thumper. The membership also includes access to Steve McQueen's house designed by architect Hugh M. Kaptur and "The Boat House" built in 1989 for race car driver James Jeffords. According to Worster, the membership includes "10 nights use of all three homes simultaneously." All three homes at once? We're guessing that price tag of membership is directed more at corporations than individuals. Worster also notes that clients may have numerous family members. Update: (Additionally, all three homes are owned by the same person, it should be noted). Meanwhile, having been in the Elrod House, we can report it's even swankier than the pictures show.